Hallways are part of your home too so don’t neglect them when designing your house. Many times they are used as an art gallery or a place to display family pictures so why not glam them up a bit? 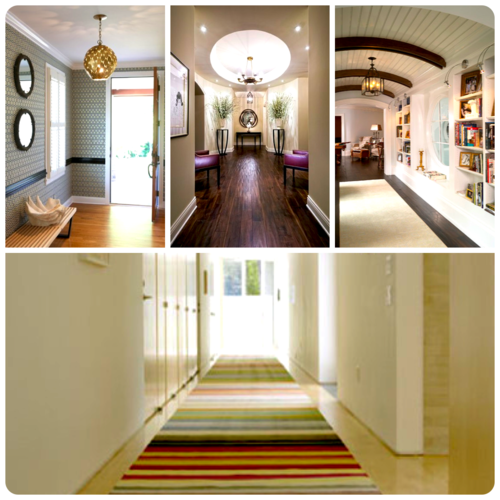 Here are 4 ways to transform your hallway from dreary to dazzling. 1. Don’t be afraid of using a fun wallpaper. Because you don’t spend enough time in halls, you won’t grow tired of the pattern and it gives a little pick-me-up from one room to the next. 2. Creating a magnificent focal point at the end of a particularly long hallway helps to distract from the length as well as offers a destination point. 3. If you want guests or family members to linger in the hallway create built-ins that can display everything from photos to artwork as well as offer seating to browse through a magazine. 4. Finally, an easy way to make any hallway more fun is to add a bright and colorful rug. If you can’t find one long enough try adding a few side-by-side to create a faux runner.